Browse: Home / 2016 / June / 17 / Rigged Contest… French Government Disqualifies Skeptic Climate Project, Claiming It “Did Not Fulfill Criteria”! Now the latest on the French government disappearing a skeptic project from a climate contest. In a contest that is set up to find the best solutions to a “problem”, it is not always wise to propose irrefutable scientific evidence that shows the “problem” does not even exist, and thus making the contest a waste of money and resources…and especially if your chances of winning are good! 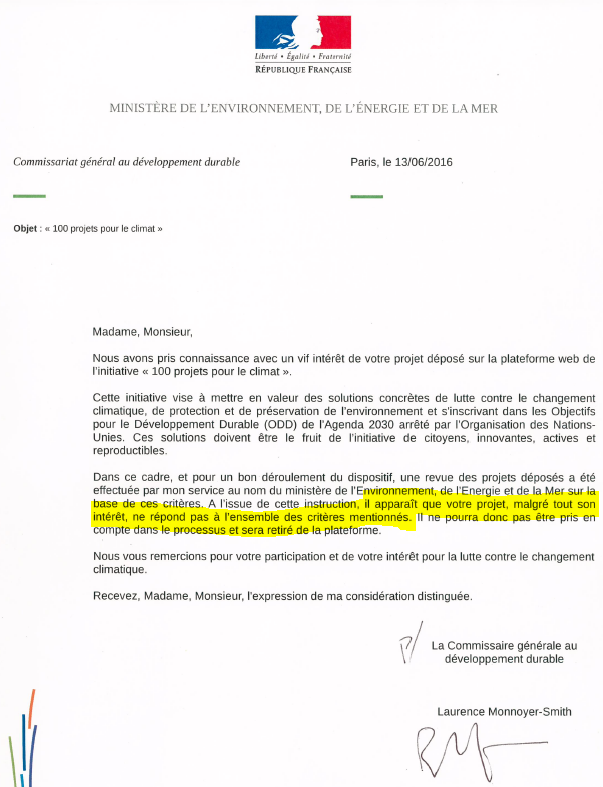 Dr. Sebastian Lüning informs that he has received a letter from the French government (see below with my translation), explaining why his project was disqualified. As reported on several occasions already at this site, the French government is holding a competition that allows people to vote via the Internet to support projects on climate change. Our Medieval Warm Period (MWP) Map was among the voting. The voting runs from June 6 to July 6, 2016. Many readers have already cast their votes. We would like to thank these readers for their support. Also internationally there has been vibrant interest for the project after notrickszone.com reported on the contest. Unfortunately we must inform you that all votes cast for the MWP project up to now have been declared invalid by the French Federal Ministry for Environment, Energy and the Oceans. One week after voting began on June 13, 2016, we received a letter from the Ministry stating that the project had to be taken out of the competition. Reason: It did not fulfill the criteria of the competition. It was signed by the French General Commissar for Sustainable Development. You can see a copy of the original letter below, which we provide in its entirety in the spirit of sustainable transparency. Since then only an error message appears at the original project page of the ‘100 Projects for the Climate’ site. On the background for the reasons behind the move, one can only speculate. Presumably the MWP Map project received such a great number of votes that the organizers got scared and panicked. Obviously public demands a scientific clarification of the pre-industrial climate development, which up to now has not been available to this degree of detail and user-friendliness – despite the millions that have been poured into climate research. Obviously it is not a welcome development that the natural warm period of 1000 years ago would get such attention. Thus someone had to pull the emergency brake, and quickly sweep it all under the carpet and hope no one notices. Not exactly very tactful. 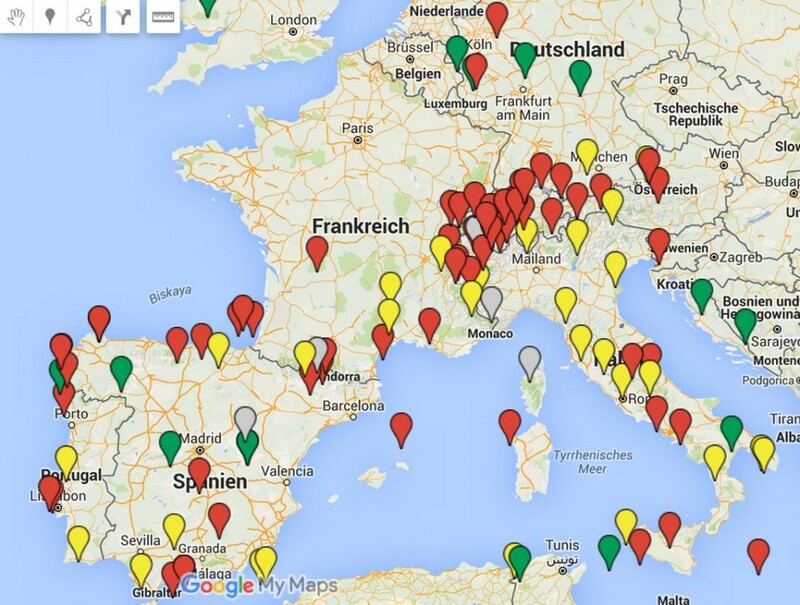 Moreover, the MWP Map has recently revealed something quite interesting for France: Except for Southern France and the French Alps, there has been an embarrassing data gap on French climate history of the past 1000 years. Note that the data recording for France has already been concluded for our first round. We have taken notice with great interest of the project you submitted on our web-platform concerning the initiative: “100 projects for the climate”. This initiative aims to put value on concrete solutions to combat climate change, protect and preserve the environment, and falls on the objectives for sustainable development of Agenda 2030 put forth by the United Nations. These solutions should be the fruit of the imitative of citizens, innovative, active and reproducible. Within this scope, and for a smooth processing, a review of the submitted projects was conducted by myself on behalf of the Ministry of Environment, Energy and the Oceans based on the criteria. Using this guideline it appears that your project, despite all the interest shown in it, does not fulfill the mentioned criteria. Therefore it may not be included and will be removed from the web platform. We thank you for your participation and your interest in the fight against climatic change. I looked at the other projects and none of them involve scientific studies of the past. The project clearly doesn’t fit the criteria. Perhaps next time it can be resubmitted as a “building consensus for the future” project or an “educate the children” project. There are several of those. In all honesty, though, would you really expect unbiased or neutral treatment from someone with a job title (“Commissar General for Sustainable Development”) composed entirely of UN Newspeak? “Solutions concretes de lutte contre le changement climatique”. What to do in our struggle against a changing climate. It’s obvious that a map, showing a changing climate, isn’t a solution. The French Government is right because their question is outrageous. IMHO cooling down the earth to zero Kelvin is the only concrete solution. I’m surprise Dr. Lüning was allowed to get as far as he did. And the fact that he now has an official letter to document the hypocrisy is in itself a victory, IMO. What he needs to do now is “run with it,” as it were. Make the most of their admission that they have no interest whatever in getting at the truth, but only finding and exploiting gullible useful idiots to advance their fascist agenda. Useful idiots, Yonason? If thirty years ago someone would have asked me what to do against a changing climate, I would have diagnosed him as a psychiatric patient. The whole issue perfectly fits with the delusions of lone wolves. Time and again we see what concrete solutions are realized by these people. Our governments are playing with fire with their calls for solutions. Probably so, Mindert. And one only hopes THEY are the ones who get burned. they were operating outside the limited predetermined scope of the initiative. And this is a perfect example of why the IPCC cannot ever find that global warming isn’t a problem, because they are NOT allowed to. What the Dr. Lüning effort succeeded at doing was to expose the motivation of the lunatics in the French government, and by extension those in the UN IPCC. Thank you, sir, I’d say your mission was a complete success. Watch for the Strisand effect. Actually, despite its title, this contest had very little to do with climate. It was much more about “sustainable development”, climate being just a pretext. “Solutions in every domain of climate action. This is a nice piece of pompous and meaningless bureaucratic language. It is so vague that they can give it the signification they want. Essentially it was a call for papers that support the hypothesis of the warmists. It was really a call for an echo chamber. This is the opposite of the scientific method, to call for papers that agree with your models, and then claim that the plethora of agreeable papers somehow prove that your models are ‘settled science’ and ‘scientific consensus’. What tautological garbage! It’s not only that. It’s a lot more, or wants to be, I think. It’s a call for suggested actions to be taken in the name of the core ideology of the new social order. They’ll select and fund the most popular, thereby guaranteeing maximum participation. Once that phase is complete, they can expand on it, and eventually get everyone to participate, whether they want to or not. If I’m correct, it’s a lot more insidious than it may at first appear. But what to do about it? I don’t know. But I do know that quite a bit more opposition to it would be needed than currently seems to exist. Well, remove the political caste of the EU from power; destroy the EU. These are power-drunk maniacs. They gotta go. They’re pretty good at destroying it themselves. Just look at youth unemployment in the PIGS. Gotta have support for it, and the organization to carry it out. I don’t see that happening there, or in America where the political caste is also out of control, though maybe not yet to the same extent as the EU. Of course if it were a genuine fight, the classic rule is first to understand your opponent. If you skip that kind of step, or even worse, reject it when it is freely offered, you may be indulging in a toy fight with toy swords, and so on. sod is strangely quiet on this.